This award, bestowed annually on a faculty member in the College of Science, is named in honor of Father James Shilts, C.S.C. who taught in the Department of Physics from 1961 until his death in 1982. The award was endowed in 1984 by Eugene T. Leonard, III in memory of his parents, Eugene and Doris Leonard. Leonard, III was a member of the Science Advisory Council from 1976 until 1991. The award recognizes a faculty member who has demonstrated sustained excellence in teaching. Galvin earned his Ph.D. in mathematics from Rutgers University. 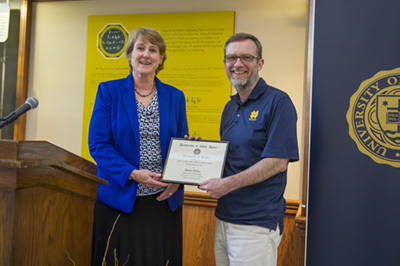 He was appointed assistant professor in the Department of Mathematics at Notre Dame in 2007 and was promoted to associate professor in 2013. His research interests lie in the areas of discrete probability, combinatorics and graph theory. Originally published by Marissa Gebhard at science.nd.edu on May 17, 2016.